PEZ caught up with consummate American professional Mark McCormack recently, as McCormack battles through the wintry nastiness that is Cyclocross. Lest we forget, McCormack recently finished yet another superb road season, the man just can't get enough, and reminds us that being a bike racer involves RACING. PEZ: How did the weather this weekend (in the 70’s) and the track conditions (dry and dusty) affect your race? MM: In Cyclocross, the weather is almost 30% of the race. Here in San Francisco it is not so hot, but the weather yesterday was almost like the far extreme of racing in the cold and snow. Yesterday the weather component was as difficult as racing in the cold and rain. For me cyclocross is 50% to 60% course, 10 to 20%competitors and 20- 30% weather. Every rider has his specialty. Some do unbelievably well in super slick, nasty, cold weather, other riders do really good in tacky conditions, others thrive in super hot days and others do well on almost any surface area. That’s why if you look at the results over the course of a year, not one rider wins all of the time. Even if one rider is stronger than everyone else, it still does not mean that you are going to win because of the weather impacts the course. McCormack and Tim Johnson have gone toe to toe on many occasions this Fall. So someone that has unbelievable power on a greasy course might not be able to apply that power. The sand at this course was so deep, you would think look- that’s a nice burm. But if you didn’t stay in the deepest part of the sand you would just bog down, because the burm would just give way. It was like a mirage. PEZ: I have read that your “Keys to success” are: setting goals, staying focused and having fun. How does this philosophy influence your coaching? MM: I believe that these Keys to Success are very important. They are valid whether you are a high level pro or someone who wants to do weekend rides with your friends. You have to have goals, and everyone's goals are going to be different. My goals, say to win a National Championship or to win a US Grand Prix race, you know that is a pretty high level. But someone else's goal might be to finish in a main pack in a local criterium, or someone else's goal might be to finish a century ride in six hours. There are millions of goals that people can set. Not any one goal is any more important than another goal. It's what ever your priorities are as an individual. You have to set that goal so that you have a target. You can get more out of the sport if you find a focus point. It can be one particular thing or it can be ten different things. Your goals have to be attainable or they can be just above attainable to provide you with that extra motivation to push yourself. At the same time you have to keep it fun. You have to find a way to work toward those goals but at the same time make it enjoyable. This sport is very challenging, so if you are not having a good time why be involved? I love the sport, so for me it is fun. So then when you actually achieve your goals, the joy is that much greater. So then you have to look at your goals and notch them up. If you complete a century in six hours the next goal would be to try and complete the next one in five and one half hours. If you fall way short of your goals then you have to realize that you set something that was a little too high, so you have to lower your goals a notch, but always find a reason why it is fun and use that a motivation. 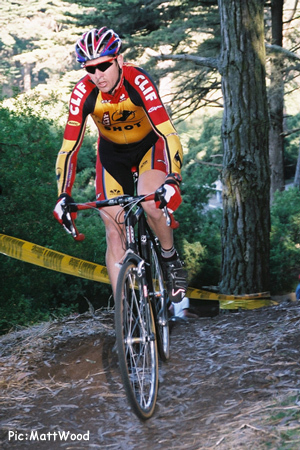 PEZ: Speaking of goals, what were your goals for the Cyclocross season? MM: I wanted to win as least one USGP and try to win the series. I was close. If I had won today I would have won the series - no matter who got second. It was an attainable goal, but I fell a little short. The course got the better of me in a few of the techinical sections. When you race against the best guys, one small mistake at the wrong time can mean the end. Barry [Wicks] and Todd [Wells] had five seconds on me when they hit the pavement, and they drilled it. Two guys facing each other on a paved climb, the guy in the front is going as hard as he can and the guy in the back is going as hard as he can, more than likely the gap is going to stay the same. Every time I stayed with those guys on the pavement or the track, the pace really chilled out, and I could recover. For three or four laps I doing all righ. I had a really good chance. That is bike racing. I didn’t achieve my end goal, which was to win the series, but I gave it a good effort. I came out and tried every week. I had a really bad week at Gloucester, Massachusetts. I had two races in Gloucester after a root canal, and I was on antibiotics, so it was not good timing. I have won that race a few times, but not in the last few years, so the saga continues for me there. PEZ: Tell us about the difference between 'Cross racing on the West Coast versus the East Coast? MM: I think that the spectator passion is there on both sides. The knowledge of the spectators is great. The courses tend to vary a little more. Typically, here [on the West Coast] the subsurface is more sandy based and the areas that you are allowed to ride tend to be unmanicured, really raw ground, so even if it is grassy, it tends to be brutally ruff. Whereas, on the East Coast we have easier access to public property like school grounds, and public parks that are in really great shape. West Coast riders have won on the East Coast and East Coast riders have won on the West Coast. I was talking to someone earlier, and they said it will be great, you are going to have the Nationals near your house [Nats are in Rhode Island], you will have a good home court advantage. In the end there isn’t really such a thing. It is great to have some more spectators on your side, you don’t have to fly to the course. In the end when they say “go”, everyone that starts that race has a realistic chance of winning. Its not like I am going into Providence with any inside scoop. JJ Haedo won the Bank of America Crit this year, but not without a whole helluva lot of help from his team. MM: Two things happened last year: we lost our major sprinter Juan Jose Haedo, an Argentine rider, which was a big loss. He helped us win a lot big races, but he also got some really great help from his teammates. So, the core of the team is still there. We signed Victor though, who is a very fast sprinter. 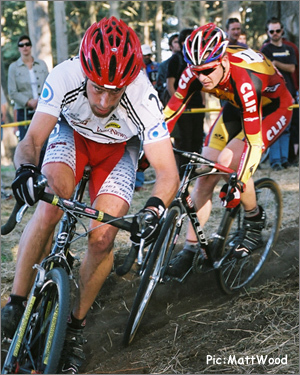 I raced with him for two years with Saturn in 2002 and 2003, and I raced against him when he was with Navigators in 2004. 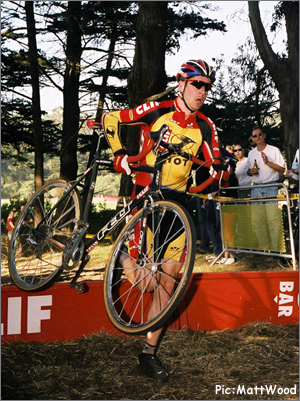 We did not see much of him in 2005 because he was racing with Phonak in Europe. He's a great young talent, a really fast sprinter, good time triallist, just a really balanced rider with amazing finish speed. I think he was second or third in the Trenton Wachovia race which is won by guys like Fred Rodriguez. 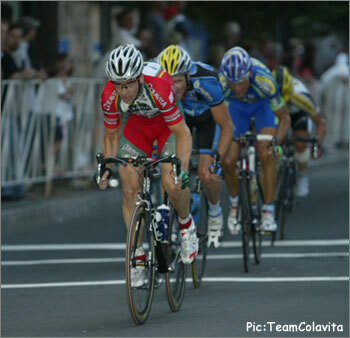 The Tour of Connecticut is fast becoming a McCormack dominated event. We also signed Kyle Wamsley this year. He won the Tour of Sommerville. 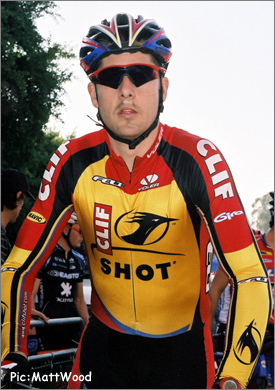 I ran across him in a few breakaways and was really impressed with his savvy and his ability to read the race and not panic and overreact as most younger riders would do. He is very patient. 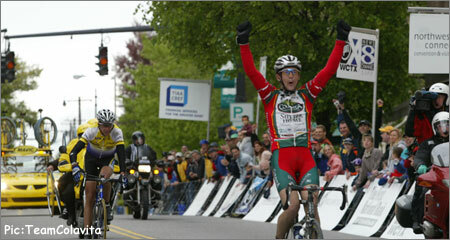 I also saw him in The 2005 Global Living Tour of Grandview Circuit Race in Columbus, Ohio. He has the smarts. He is not going to be the stongest rider on our team, but he has good savvy, ability to read the race and speed. So if he gets in a breakaway, he is a valid contender to win, so it takes a lot of presure off the team if you can have a guy like that who can cover moves and not just cover them to kill them, but cover them with a chance of winning. That is another option that the team has. Kyle is a good young signing, as well as Victor, another good, young signing. Victor is enthusiastic about his return to the States. PEZ: Before the San Francisco GP this year, the Colavita team spent the week at the Sutter Home Winery Property, tell me a little about the week. MM: We had a training camp at Sutter Home at the start of the year. They did a fantastic job hosting us at their compound. They have some private houses, so the whole team met there for the first time, and we got to hang out with the people of Sutter Home which gave us a great feeling about their co-sponsorship. You know with some sponsors, you never really get a vibe from them. You see their colors on your jersey, you see the products in the cars and the stuff that gets given away at races, but not much more. It is really great to have a sponsor get that involved - one that actually invites you to stay with them on their property. They had a couple of functions for us that we participated in, and then again at the end of the year knowing that the race was in San Francisco, my brother Frank and the people from Sutter Home started talking early in the season about coming over early for San Francisco instead of just flying in the day before, doing the race as if it's just another race. So we go to come in on Monday, of the week of San Francisco; we did a great little training camp in the Napa Valley, through the vineyards of Sutter Home, and the weather was extremely hot, but we did some great training there. 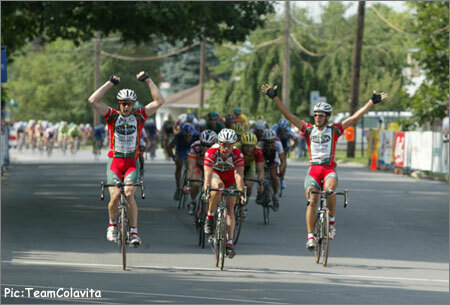 Podium sweep for Colavita/Sutter Home at one of the stages at the Tour de Toona this year. Then we moved down to Emeryville, which is right across the bay from San Francisco for Friday night and Saturday. Just getting in early, training, staying in a house, cooking food, just living a regular life was great. You know, coming from the East Coast is such a challenge, it really impacts your racing. Racing the San Francisco race is such a hard race. You had better be on your “A” game. To have that flight be out of the way, along with some great training helped us have a great race. We put four or five riders in that front group. We didn’t win the race but for our domestic program we did well. We were close. It just showed the support Sutter Home provided for our team. Sutter Home now can see the benefits from being involved in cycling. The good values of health and physical fitness, and of course there is the value of Colavita Oil being a high quality brand to partner with the great rank of Sutter Home wines. Many higher ups from Sutter Home came to the race with their families. It is great for them to see how hard we work. They work hard at their jobs, it's great for them to see us out there giving it our all.